(September 12, 2018) -- The York Revolution earned a doubleheader split with a 6-2 nightcap win over the Road Warriors after dropping the first game 6-1 on Wednesday night at PeoplesBank Park. The Road Warriors opened the scoring in Game 1 with two runs in the third off Revs starter Robert Carson. Anthony Ray scored the first run on a passed ball and the second run came home on Edwin Gomez’ RBI single, making it a 2-0 game. The Road Warriors added four more runs on four hits in the fourth, including an RBI double from Gomez to extend their lead to 6-0. The Revs kept it a six-run game in the top of the fifth when they turned a 5-4-3 triple play, the first in franchise history. Jailen Peguero got Geraldo Valentin to hit a chopper to third that ended what looked to be another Road Warriors threat. The Revs' only run came in the bottom of the fifth when Henry Castillo scored on a throwing error by Road Warriors first baseman Geraldo Valentin, cutting their deficit to 6-1. Alberto Rodriguez (2-7) was strong from the start for the Road Warriors. He earned the win after six and one-third innings, allowing just one unearned run. Carson (10-7) suffered the loss after giving up five runs (four earned) in just three-plus innings. The Revs came alive in Game 2 and went up 3-0 in the bottom of the second when Castillo blasted a two-out, three-run home run to left-center off Road Warriors starter Raul Rivera. The Revs got another run in the third on Telvin Nash’s RBI groundout, making it 4-0. The Road Warriors answered with a two-run single up the middle by Melvin Rodriguez in the top of the fifth, plating a pair of inherited runs charged to starter Joe Van Meter. 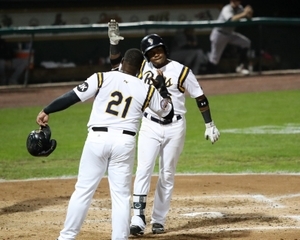 The Revs got their two-run lead right back in the bottom of the fifth when Nash ripped an RBI single to left and Jared Mitchell added a two-out bloop RBI single to left, extending their lead to 6-2. Van Meter struck out seven batters in four-plus innings, but did not factor in the decision. James Pugliese (5-1) logged a scoreless inning in relief of Van Meter to earn the win. Rivera (4-14) was tagged for six runs in four and one-third innings in the loss. Notes: The Revs have won seven of their last eight games. Van Meter reached a single-season career-high in innings pitched, finishing the night with 84.2 IP. Van Meter has struck out at least six batters in seven of his 11 starts. Dustin Richardson closed it out with a 1-2-3 seventh and has not allowed a run in his last eight innings, spanning seven appearances. Up Next: The Revs are off on Thursday before hosting a doubleheader on Friday against Somerset at 5 p.m. to open a four-game series, the final series of the 2018 regular season. It is Ladies Night presented by UPMC Pinnacle as Ladies get in FREE! There is also a Knit Hat Giveaway presented by HealthSouth Rehabilitation Hospital of York and a Belly Buster Picnic in the Bullpen Balcony. The game is sponsored by the York County Economic Alliance. Tickets are on sale at YorkRevolution.com, (717) 801-HITS, and in-person at the Revs Ticket Office.